Bastian Salbart takes the next step in threading his way through the music industry to get straight into your mind. 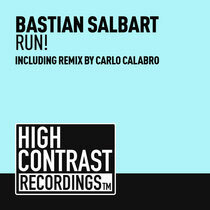 His latest track is ‘Run’, which is out 9 December on High Contrast Recordings / Be Yourself Music. The original mix contains atmospheric, gentle bells accompanied by background vocals before progressing into a heavier beat. The Carlo Calabro Remix brings out more groove and tinkers more with all the dirty stuff Bastian Salbart provided with the Original Mix. There's also the drop in both versions for all those who like unexpected twists. Check it out below.